Upgrading the Piccadilly: Calling Time on Mind the Gap? In recent months on London Reconnections we have looked at the future of most of the tube lines, with articles on the Metropolitan Line, the other Sub-Surface Railway (SSR) Lines and the deep tube lines. Some lines, however, deserve a look in more detail than others – and one of those is the Piccadilly. We omitted the Piccadilly Line from the general look at deep level tube lines because it was worthy of at least one article on its own. In fact it will actually get the best part of two, because it is important to look at the various important developments without, as much as possible, the distraction of the debate on driverless trains. Here we look at the facts, and where possible leave the politics and educated guesses of whether the trains will actually have any staff on them to a follow-up article. Early in 2013 we looked in great detail at the Northern Line. We warned that although we were pretty confident we could paint an accurate general picture of what is expected to happen, we could not be correct in every detail. This is not least because even if we are correct as to current thoughts and policy, it does not necessarily mean that these will be present in the final product. The same caveat applies to this article. The Piccadilly Line Upgrade is not just another upgrade. Mindful of the fact that tube trains tend to stay in service for at least 35 years – and this length of time is getting longer – the decision was taken on the Piccadilly to really plan for the future. This covers every aspect of an underground line not just the trains. Effectively, the Piccadilly Line Upgrade is the intended output of a massive forward-thinking research & development project currently called “New Tube for London” (NTfL). As we saw in a previous article, this is supposed to be about a new tube specification for the Piccadilly, Bakerloo, Waterloo & City and Central Lines. Funding, however, is currently only available for the Piccadilly Line, so despite the grand title it is perhaps best to think of it as the Piccadilly Line Upgrade, with the other deep lines to perhaps follow at some point in the future. 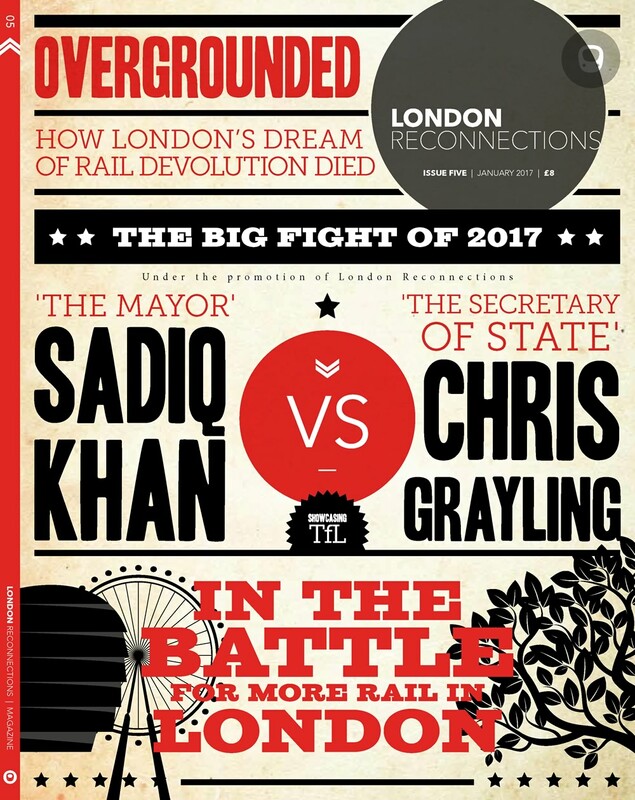 Because the Piccadilly Line Upgrade is a forward looking project it is really driven by one factor – and although both the media and various political figures persist in thinking otherwise, that factor is emphatically not driverless trains. The feature which underpins just about everything about this project is energy. This is either in the form of minimising the electrical energy required to run the trains or getting rid of excess heat energy. Obviously these two facets are not unrelated. That said, the driverless trains issue is important to the designers and the decision has been taken at an early stage to design the upgrade so that the trains are capable of being run in service without any member of staff on board. This is generally referred to as Unattended Train Operation (UTO). The fact, however, that the trains are capable of being operated in UTO mode does not mean that they will. On modern transport networks once a system is designed to be UTO-capable then a mandatory requirement almost always now follows – the network or line in question should have platform-edge doors at all stations, including the above ground ones. Furthermore platform levels must be aligned with the floor level of the trains. This is certainly the situation in Paris with Ligne 1 and one suspects that some of our more astute readers are rapidly grasping the significant consequences that this means for the Piccadilly Line. As if that were not challenging enough, a further requirement is that there should be no significant gap between the train and the platform. This is obviously going to be quite a challenge on a tube system famous for its “mind the gap” announcements. One where in a great number of cases simply straightening existing platforms is just not feasible. Before we look at the trains themselves and the technology needed to support them, therefore, we need to look at some of the fundamental questions that will need to be addressed about the destinations of the future Piccadilly Line. For, as previously noted, those familiar with the line will have quickly seen that if we have platform edge doors there are going to be considerable problems at Ealing Common station (where the platform is shared with the District Line S7 stock) and the Rayners Lane – Uxbridge stretch of line, which is shared with Metropolitan Line S8 stock. Originally, the problem at the extreme end of the shared line between Rayners Lane and Uxbridge was going to be resolved by the simple expedient of terminating all Piccadilly Line trains at Rayners Lane. When the disadvantage to passengers was quantified, however, it was realised that this would produce considerable disbenefits in terms of longer journey times. The extra time involved was not that great per passenger, but there were an awful lot of them. Many people originally believed that terminating at Rayners Lane would be inevitable due to disability legislation and the need for step-free access onto the train. In fact derogation was successfully sought when the S stock on the Metropolitan Line was introduced, so there is no reason to believe that it could not be obtained for the Piccadilly Line stock. The question then was thus whether to pursue trains being UTO-capable, despite the disadvantage to passengers, or to abandon it. There was, however, another problem. 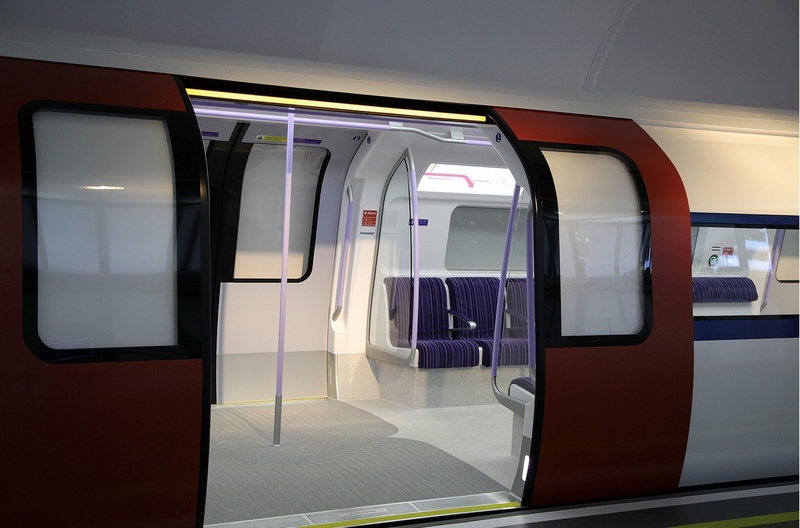 Great care was being taken with the new Piccadilly Line trains to provide appropriate doors at the ideal spacing – but as a consequence there was no way that these would be in the same position as S stock doors. With the doors on the two types of rolling stock destined to be out of alignment, platform edge doors effectively became a non-starter and consequently running trains on this joint section would seem to be totally incompatible with UTO. The current thinking thus appears to be that the Piccadilly Line should be UTO-capable except for Rayners Lane to Uxbridge. If the Piccadilly Line is run as a UTO line, then for these stations it is expected that a DLR style train captain will need to be on board to supervise boarding and alighting. If UTO were to happen on the rest of the line it is not clear whether the train captain will board at Rayners Lane (westbound) or South Harrow (the previous stop), or whether this would simply mean that one was present for the entire journey (although this would obviously require a greater number of staff to achieve). Further south there is the issue of shared track with the District Line through Ealing Common station. This has been an operating nuisance for many years. In fact in 1949 there were proposals to lay additional tracks and rebuild Ealing Common station in order to provide segregated lines for the District and Piccadilly Lines between Acton Town and Hanger Lane Junction – the junction just north of Ealing Common station where District Line trains turn off for Ealing Broadway. This and a number of other schemes were rejected by the government of the day – most likely because there was not the money available, rather than because it was not worth doing in 1949. If it were just a case of sharing the track then sharing with the District Line would not, on its own, have been that great an issue. Nevertheless, as lines get more trains per hour the opportunities for sharing track without delaying or disrupting services diminish. At the same time the consequences of delays become more significant and disruptive. One solution would be to finally implement the 1949 proposal to separate the two lines, but it is probably much more difficult to do that today with increased urban development. Alternatively one could require each platform at Ealing Common to be permanently staffed with a train dispatcher who has to give authority for the doors to close and further authority for the train to depart. Neither of these two options is, however, currently the plan. Instead a radical solution is proposed – one that a first sight appears to verge on madness. Bear with us, however, for with further thought it is a solution that can be seen to make a lot of sense. The proposal is that the Ealing Broadway branch of the District Line be transferred to the Piccadilly Line. The District Line will have only just been resignalled and now it looks like the branch to Ealing Broadway will need resignalling again. Some journeys such as Richmond to Ealing Broadway would involve going all the way to Hammersmith to change. Chiswick Park station would need to be added to the Piccadilly Line, which would mean platform height alterations and new points so the Piccadilly Line would call there. This would not be a popular move with most station users who would probably see their daily journey involving a change back onto the District Line at Hammersmith or Barons Court. Ealing Common depot is the depot for the District Line on the west side of London. If the Piccadilly Line goes to Ealing Broadway instead, then the District Line depot will not be on the line it serves. The Piccadilly Line serves Heathrow. One would not want additional branches on the Piccadilly Line if it meant lowering the proportion of trains that serve this busy transport hub. The Piccadilly Line effectively already has three ultimate destinations in the west (Heathow Terminal 5, Heathrow terminal 4 and Uxbridge). A fourth would make operating the line even more difficult. Given that this is a long term plan there is no need to re-signal the Ealing Broadway branch twice. For example, knowing the long term plan, one could continue to have District Line trains driven manually between Acton Town and Ealing Broadway until the Piccadilly takes over. Subsequent to this strategy being adopted it now actually looks more and more likely like that either the same signalling system will be used for both lines or at least there will be a higher level of compatibility making this less of an issue. The problem of longer journeys involving a change at Hammersmith and doubling back could be eliminated by stopping all Piccadilly Line trains at Turnham Green. This would also eliminate the current situation when Piccadilly Line trains only stop at Turnham Green at certain times. The platforms for Chiswick Park could be relocated on the Richmond branch. Furthermore, by diverting all former District Line Ealing Broadway trains to Richmond the service from Chiswick Park would be much better than previously with double the number of trains. The fact that the depot isn’t on the line doesn’t really matter. In west London many drivers book on and off at Earls Court so many shifts would be unaffected. There would be some “dead running” but this cannot be avoided. One can only send a limited number of trains to Heathrow. Due to passengers typically being unfamiliar with the tube, possibly jetlagged, and also having a lot of luggage you are never going to be able to run that many trains to Heathrow anyway as the dwell times have to be longer. Even if the Piccadilly only runs a maximum 32tph there are plenty of trains to serve Uxbridge and Ealing Broadway. In 2023 the concession for Heathrow Express expires. It is not currently clear what will happen then, but presumably the mayor would be free to run more Crossrail services to Heathrow – and without charging a fares premium. If that were to happen, and given that there is little chance of any significant capacity expansion at Heathrow in the short to medium term, then it could reasonably be expected that the number of passengers on the Heathrow branch of the Piccadilly Line would actually go down. The number of trains required to serve Ealing Broadway will not be that great if passengers transfer to Crossrail, so it wouldn’t take many trains to provide an adequate service. The fact that the branches of the Piccadilly line are imbalanced is irrelevant. If you run 32tph through the central area then you need the facility to turn round 32tph on the western branches regardless of what is happening on the east side of the line. You are not going to need more than 8tph for Uxbridge and they need to dovetail in with the 16tph on the Metropolitan Line to Uxbridge. There is a limit to what you can run to Heathrow so in practice you can also serve Ealing Broadway without other branches suffering. The Underground Map in showing Ealing Broadway and surrounding stations in 2024? It makes the Piccadilly Line completely independent of the District Line for normal daily working. The District Line can run 16tph to Richmond in the peak period instead of the currently inadequate 8tph. Turnham Green has always had a strange and quirky history of being partially served by the Piccadilly Line. For many years this happened early in the morning and late at night when the District Line was running with extended intervals and on Sundays. With a much more frequent Sunday service on all lines (except the Waterloo & City of course) the all day service on Sunday was dropped. As we have already seen though, the upgrade of the Piccadilly Line raises a couple of issues regarding stopping at Turnham Green. The first is that if the District Line no longer goes to Ealing Broadway then it would make some sense for Piccadilly Line trains to stop at Turnham Green as the first (or last) station served by both lines. This would avoid longer journey times for journeys such Richmond to Acton Town as well as reduce others such as Heathrow to Richmond. The latter could probably more sensibly be done by bus to Feltham and then main line train but for those relying on the Underground Map or with bulky luggage the Underground will always be the more obvious option. The other issue at Turnham Green is platform edge doors. These are extremely expensive to install, so realistically you either have to abandon stops at Turnham Green or you have to make installing the platform edge doors worthwhile by having trains call there all day. It is likely significant that London Underground recently launched a consultation for views on additional Piccadilly Line trains stopping at Turnham Green. Whilst this was partially done because of local pressure to provide a better service at that station and the timing was probably not what London Underground would have liked (far too early), the idea in principle probably did not go down too badly at LU headquarters. It has the feel of similar consultations on direct services to Chesham or withdrawing the District Line to Olympia on weekdays – all part of the process of getting the pieces to fit into the final scheme. BorisWatch spotted a local report that claims that the mayor has agreed that Piccadilly Line trains will stop all day “when the Piccadilly line is upgraded” which seems to support all the above, although this should likely be read as actually meaning when the Piccadilly Line goes to Ealing Broadway. In reality this would not be expected before both Crossrail provides additional relief for Heathrow traffic and all the old 1973 stock trains, with their less optimal performance capability, are withdrawn. On that basis 2023 is an optimistic estimate for this happening. Turnham Green is not the only station where there is some interaction between District and Piccadilly Lines. The Piccadilly Line currently has rarely used platforms at Ravenscourt Park (both directions) and Stamford Brook (westbound only). It would seem that that Piccadilly Line trains will no longer be able to call at these platforms under any circumstances, there being no economic way of them being upgraded. There is also currently the option for the Piccadilly Line and the District Line to share each others tracks between Acton Town and Hammersmith. There would seem no reason why this should not continue in future between Turnham Green and Hammersmith providing suitable junctions were installed at Turnham Green. The only restriction would be that Piccadilly Line trains would be unable to stop at any platform not equipped with platform edge doors. As we mentioned at the top of this article, traditionally railway carriages have lasted for between 35 and 40 years before needing replacing. Recently on the Underground we have seen this extend to 45 or 50 years due to a better quality build. At the same time a deep-level tube train has hardly changed at all in outward appearance other than the colour of the finish since the 1938 stock. A Victoria Line 2009 stock looks much the same. The doors are in the same position and are approximately the same width. The bogie and carriage layout is the same. The passenger air conditioning system is the same in both stocks – none at all. It has long been recognised that nowadays what you specify at the outset is probably what you are going to be stuck with for the next fifty years. A Siemens promotional video of their potential offering for the Piccadilly Line. Because of the tight specification if another supplier won the contract the train would probably be very similar. This is all just window-dressing. The interesting and critical parts of the new train will not be visible. As stated at the outset, there were two related factors that really drove the need for a radical rethink of what a tube train should be. Contrary to most people’s immediate thoughts neither of these are the need to operate without a driver. The critical factors are heat and energy. When the tube was built no-one gave a thought to the extraction of heat. Quite the opposite. The tube was quite cool but at least not directly exposed to the outside weather and there was thus no real reason to consider it. Even as air conditioning became technically feasible in mainstream life, few people expected to encounter it in the UK and certainly not on public transport. In any case heat on the Underground really wasn’t a problem. There wasn’t much heat created with trains not as frequent as now – certainly not off-peak which was most of the day – and fewer passengers added their own body heat. The newly-built tube was also bored through cool subsoil and thus came with its own cooling system built in. The trouble is, after a hundred years use, that cool subsoil had now warmed up and is now helping keep the heat trapped in rather than removing it. A multitude of factors thus mean that the need to extract heat can no longer be ignored. Energy has also become critical. The obvious reason is cost. There would not be much point in spending large sums of money eliminating drivers if energy costs were higher and potentially easier to bring down anyway. For London Underground it was more than that though. There was also the ethical issue of minimising greenhouse gases. One can ethically source one’s electricity but that only stops someone else having theirs ethically sourced. Finally, removing excess heat from people and trains on the Underground is hard – so why not try to avoid producing the heat in the first place? Essentially any energy that isn’t recycled through regeneration will ultimately end up as heat and require yet more energy to extract that heat outside the tunnels. One of the biggest contributors to the energy requirements of a train is weight, and a lot of the unladen weight of a multiple unit train is thus in the bogies. So a good way to start saving energy is to cut down on the number of bogies in the train. This has a double benefit because in the current traditional tube train there is absolutely no place available for the air-conditioning units – as clearly an air-conditioning unit is never going to fit in the roof of a deep tube train. Cut down the number of bogies though and it gives you some space under the floor. Of course it is not enough just to get the heat out of the train. It then needs to be got out of the tunnel and on the Piccadilly Line it is intended that around a dozen stations on the line are going to have big projects to remove the heat from the tunnels at that location. The original idea was to have a bogie at each end of the middle carriage, with all the other carriages having a bogie located at the end furthest from the middle. The current thinking though appears to be that the bogie should be shared between the two adjacent carriages. Each end of the train would have a full bogie of course, so the number of bogies is one greater than the number of carriages rather than twice the number of carriages – a good saving. This is a considerable saving, although it is worth noting that the carriages will be shorter at 10.7 metres long rather than the current 17.5m. The carriages need to be short so they can be wider as they will be less restricted by sharp curves. As is now swiftly becoming standard across the TfL network, the carriages on the Piccadilly will be walk-through and each carriage will have two wide double doors. It will be interesting to see what develops with the doors. If you make them wider that makes them heavier as well as causing them to take longer to shut (unless you close them quicker). Expect to see novel use of modern lightweight composite materials that we would tend to associate with aircraft not tube trains – especially on the doors. It will not just be the trains will be more energy efficient. All aspects of power supply will be looked at and critically examined. Energy loss in the conductor rails will be reduced by increasing the nominal voltage from 630V to a more standard 750V. By the time this happens this will not be new on the Underground, as by then the Sub-surface Railway ought to be operating at 750V and of course both the District and the Bakerloo work at 750V when running over Network Rail controlled tracks. Going from 630V to 750V might not seem that big a deal, but the transmission loss is inversely proportional to the square of the voltage – so it is more significant than may first appear. On the Piccadilly Line there will, of course, be regenerative braking. But here it is taken a stage further. On other lines it is necessary for a train to be on that particular line and wanting to draw power to be able to take advantage of it. On the Piccadilly Line the necessary changes will not only be made to the substations but also to the substation feeders so that pretty well any train on any line can reuse the electricity. Also on the power side it is known that there is an aspiration for the train to have sufficiently powerful batteries to get the train into a station if traction current is lost. This would considerably help in emergency situations where it is necessary to cut the power to deal with an incident (e.g. person under a train). Unfortunately due to the way the infrastructure is designed is it usually necessary to remove the power over a much larger area meaning trains are trapped and people are forced to walk through tunnels. Clearly the procedures would need rewriting as it is currently presumed that if there is no traction current then a train cannot move. In 2013 the idea of battery powered tube trains seems a bit optimistic given the present energy density of batteries. It is true that the civil engineer has battery-powered locos on the Underground and has done so for many years but it would be impractical to carry the batteries found in those locos in a tube train just for the rare occasion when they are needed. What needs to be remembered though is that battery technology is advancing all the time and installing a sufficiently powerful lightweight battery in 2020 may just be feasible. Calling time on “Mind the Gap”? Another critical component of the Piccadilly Line upgrade is the need to do something about the gap between the platform and the train if the platform is not straight or very nearly straight. The proposed solution is to have some form of retractable spacer at critical locations. This will be no small challenge. Dwell times are critical so this would have to be fast-acting. It would also have to be very reliable. Failure to engage would be a serious inconvenience, possibly causing trains to be unable to stop at that station. Failure to disengage would in fact be even worse and probably lead to the all services through the relevant station being suspended whilst the problem is fixed. This is probably the issue that the project team are most nervous of. Although it is a tried and tested system to a certain extent, such spacers are not commonly retroactively fitted to lines and it is only really Ligne 1 in Paris that has such a system fitted to an underground line built over 100 years ago. Having a retractable spacer clearly adds signficantly to the complexity as it has to be interlocked into either the signalling system or the platform-edge door control mechanism. When will we get the new trains? The intention is that the first of the new trains would appear in 2021. Given the radical nature of the project this appears to be a very ambitious timetable. It is supposed to be complete by 2024 and there are expected to be over a hundred new trains. They will have to be delivered with a cab because it is felt that it is unacceptable to not have a “driver” at the front if there are no platform edge doors – although for some reason this is not thought to be necessary for Rayners Lane – Uxbridge. Only when the last of the 1973 stock is withdrawn can the platform-edge doors be fitted and it is only when all the platform-edge doors are fitted that the cabs can be removed (or rather converted into a passenger area). What is not known is what impact the retendering of the signalling contract for the sub-surface railway will have on all this. And of course no-one knows for sure how well the 1973 stock trains currently on the Piccadilly Line will survive old age. The project team therefore have the twin-challenges of getting this radical scheme right first time and avoiding any further delay. Given the concerns of delivering the SSR upgrade on time one will imagine that their progress will be scrutinised very carefully indeed. There are clearly fundamental problems with the Acton Town junction with east bound and west bound trains stopping almost every time before getting into Acton Town. The suggestion of moving Ealing Broadway to the Piccadilly Line would add further problems as the Heathrow branch cannot currently cope with demand. 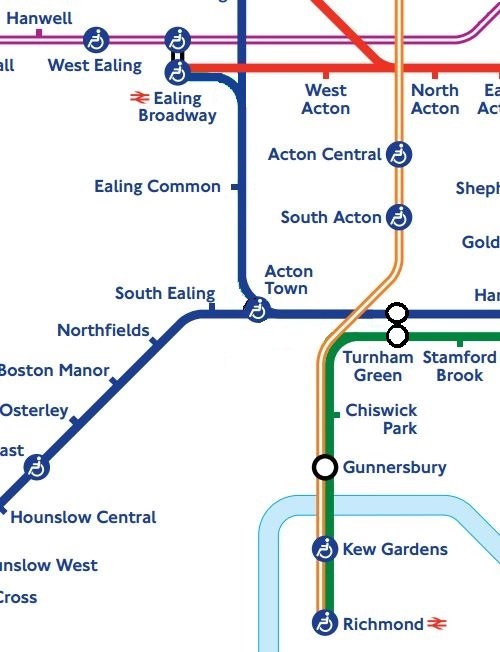 As there is only one track each way between Acton Town and Ealing Common, the only credible solution is for this track to be District Line only (serving Ealing Broadway and Rayners Lane). Surely Crossrail will help relieve the Heathrow branch? Add to it that the new trains will have more capacity inside them, and the frequency ought to increase in the core with new signalling and trains, and serving Ealing Broadway looks a bit less weird. PS – the arguments you make about problems on the Heathrow branch with serving Ealing Broadway with the Piccadilly can easily be remade about the District line. 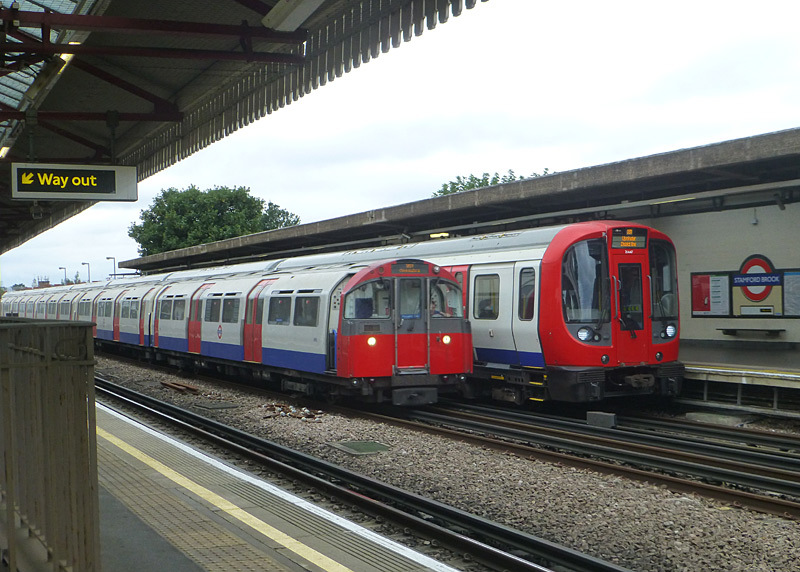 The suggestion of moving Rayners Lane to the District Line would add further problems as the Wimbledon branch cannot currently cope with demand. Anonymous – your point about the Wimbledon to Edgeware Road line highlights a common problem of track sharing and divided lines creating bottlenecks. The recent controversial extension of the circle line to Hammersmith (creating further track sharing problems) would have been avoided if the circle line was extended to Wimbledon and this branch removed from the District Line. Creating a station on the Picadilly line junction with the London Overground line (between the existing Acton Town and Chiswick Park stations) would allow the District line to Richmond be removed. Not unless you increase both the frequency and the length of the Overground trains going to Richmond to cope with the crowds – those District Line trains to Richmond are BUSY. Removing the only Tube service in the borough of Richmond is not going to make you any friends in politics either. Cutting Richmond off from the District Line would be suicidal, career ending, and possibly inviting death threats. It might be an “idea” in theory, by in actuality could not and will not happen. The letters pages (note the plural) of the Richmond & Twickenham Times are already full to bursting every week “without provoking them further”. If I were the person in authority who made such a decision, sitting on a wasps nest might be preferable. As the original Anonymous, I wasn’t talking about the Edgware Road – Wimbledon route, just the Wimbledon branch south of Earls Court. It has high demand, like Heathrow, but you argue for removing branches on the Piccadilly to feed the Heathrow branch, while adding them to the District. Your T-Cup restructing stuff suffers from the same issues that timbeau has addressed wrt Richmond: creating a railway that looks good on paper, but ignores the passengers for whom the railway exists for. Not only would you have not increased the frequency between Hammersmith and Paddington, but you’d have decreased it on the busy bit between Earls Court and Wimbledon! Actually, what people that live on the Picadilly line really need is a new chord linking us DIRECTLY to Ealing Broadway from all of the stations on the Rayners Lane branch. Then we could change at Ealing Broadway and take Crossrail into London, which would be much faster and more comfortable. Thinking that Crossrail will reduce demand between Ealing Common and Ealing Broadway is absurd. Even with that annoying, timewasting change it will still be the fastest way to get to Liverpool St, Canary Wharf or anywhere else in the City or East London. What has always been bad about the Picadilly line is that it crosses the Central Line, it crosses the mainline / future Crossrail Line and there is no interchange with either of them, so passengers are forced to endure a long tedious loop southwards and an extra 20 stops before they can change onto either one or get out and walk for 20 minutes to make the connection. So much money is spent on these big projects but how about providing connections between the lines that are already built? If a station was added near Hanger Lane and a chord was added to Ealing Broadway, that would halve journey times into London from here for a hundredth of the cost of building a new line. Old topic here, couple of comments. For those who like the thought of the “gap filling” extenders as in New York, they are a mechanical nightmare. As they are foul of the loading gauge when extended they have to be interlocked with the signalling, and are renowned for going wrong and sticking, when service to the platform has to be suspended until fixed. Dropped litter jammed in them (chewing gum is a classic) is one of many problems. They only work if there is an alternative track to divert trains to. Elimination of them was one of the drivers behind the big remodelling of Line 1 at South Ferry. There’s lots of description above of alternatives for Ealing Broadway or Chiswick Park, but nothing about Acton Town losing its District Line service altogether. The NYC gap fillers are ancient and massive machines. You can be assured that nothing like this will appear in London. However gap fillers are necessary in some places reliable mechanisms with means to address the jamming risk are being developed. With the Piccadilly to Ealing Broadway proposal, the only District trains serving Acton/Ealing would be those to/from the depot. If you want to mess around with the lines between Turnham Green and Ealing (choose one) then also bear in mind that the LO line doesn’t interconnect well either, meaning no easy link to get out to LHR (unless you like lots of lots of steps). Has anybody suggested cutting the Acton to Rayners Lane Piccadilly line, so that Picadilly just to go to Heathrow. The district line does Ealing as now but also for Rayners Lane. Change at Rayners Lane to metropolitan to go to those parts of London or change at Acton Town for Piccadilly to central London, (or from) ie now but on District? Not sure of what lines from Ealing to Rayners Lane might be possible in short time spans. Trust me, that idea is nothing new. The main problem with it is that there isn’t enough capacity on the District line to handle both the Ealing Broadway and Rayners Lane branches, the reason for that being the bottleneck at Earl’s Court (you can only send so many trains through there). Rayner’s Lane (Or Uxbridge) to/from Acton Town regular shuttle, every 5 minutes – i.e. 12 tph ??? It would probably require Ealing Broadway – Acton Town to be reduced to a shuttle. A pity the opportunity to continue to South Acton , improving connectivity between the Overground and Heathrow, is no longer possible! Upgrade plans for Holborn. Much bigger than previous plans seemed to suggest. New Ticket hall further East over Central Line and new big passages and extra escalator shafts. Exiting the Picc-line platforms can be very scary, given the crowding levels. @ Rational Plan – thanks for the heads up on that. Interesting that it mimics the approach taken at Victoria. Not sure some aspects of the design work for me – very tight clearances between escalators and gates in that new ticket hall. Very likely to cause congestion depending on how you run the escalators and gates. Also impractical if you ever need to hoard off the escalators for works. The other startling aspect, reflective of changes to ticket technology, is the tiny provision of ticket machines for what is a very, very busy station. I do wonder why LU remains fixated on providing stair only links between intermediate levels and platforms. If we have an ageing population then more and more people will find stairs difficult to use. Obviously escalators use up more horizontal and vertical space and have an increased whole life cost but other networks provide seamless vertical circulation from street to platform and don’t subject their users to an obstacle course. Obviously there is a longish planning and design timescale here but note this is another project which won’t put a spade in the ground until the next Mayoral term. That budget again given LU has been assessing how to improve Holborn for at least 20 years!! If Holborn is such a busy station, I can’t help feeling that the pressure on the Piccadilly and (particularly) Central Line platforms might have been less if someone had thought of putting platforms on that big tunnel passing across the north and west of the diagram. I understand that an access shaft for it was actually built in the Proctor Street area – will that be used in this new proposal. Can’t be sure but I suspect it’s as with Oxford Circus: feeding in Crossrail passenger numbers to tube lines will overwhelm them. Did I say there had to be interchange (other than at street level)? Holborn’s problem is the amount of locally-generated traffic. … and presumably (one of) the Crossrail designers’ problems was managing the tension between factors demanding more stations (the benefit that those extra stations could provide for their local area) and factors demanding fewer stations (the cost of building them, the delay to through passengers, the cost of the extra rolling stock caused by the increased central-London transit time, etc). I’m not saying that they got this right, necessarily, just that a decision had to be made, and it is more likely to be about right if there are roughly as many people arguing for extra stations as there are for fewer stations. @ Timbeau – an earlier iteration of Crossrail certainly did include a station at Holborn. LT bought offices at Southampton Row many years which would have been where an entrance and worksite would have been. It was a very weird and old building and really quite unsuitable. I was never based there but had to visit departments there. I believe the works that Crossrail have done at Holborn have been at that location (Google Streetview shows it as a Crossrail worksite). @WW – The funny thing is that I have at the back of my mind seeing plans several years ago and certainly long before the latest proposal, for that new entrance to Holborn station in Procter Street. Whatever, it must have been after the gents public conveniences under the centre of High Holborn just south of Procter Street were closed. They were at the time well-known (by gents only) for their glass tank, automatically-flushing cisterns for the urinals, for they had goldfish in them, lovingly cared for by the attendant. I remember them flopping about a bit as a cistern flushed but they were OK shortly thereafter. @ Graham F – I don’t recall a plan for an entrance at Procter St but that doesn’t mean there wasn’t one. I also have no experience of the public loos either! I suspect that a Holborn stop for Crossrail was removed on cost grounds probably 25+ years ago or as a concession to get the legislation through Parliament. Clearly, though, the purchase of the property on Southampton Row was deemed essential for Crossrail given LT / TfL clearly hung on to it and it has been a worksite for many years. Ahhhhhhhhh!!!! Leave it the way it is! Its fine. If you put Piccadilly Line trains to Ealing Broadway then that means there is not enough capacity on the Piccadilly Line than on the District Line. If you do take the Piccadilly Line to Ealing then that’s a lot of branches of the western end of the Piccadilly Line rather than in the eastern!! 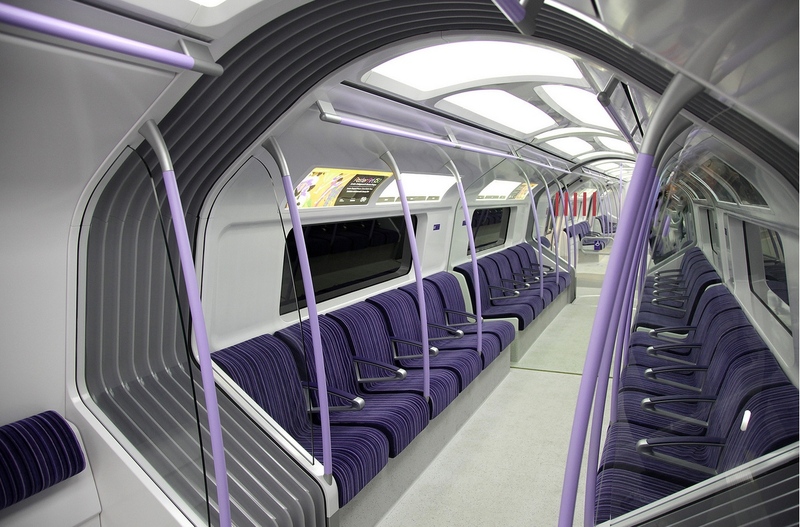 Also the S stock will carry more people than the New Tube for London. Maybe that extra train bought for MLE will be useful after all! Yes but if the District Line is going to Uxbridge then where is it starting from? If it is coming Turnham Green up to Uxbridge then Ealing Common will not be step free. I live in Ealing B. and it has been fine since. The fact that you want to put smaller trains to Ealing implies that the people at the stations along the way won’t be able to fit in the trains. Its not just about putting the Piccadilly Line to E.B. its also about capacity and step-free access. At Ealing Common all they have to do is to raise/shrink the platform at one end so it is the same height as the train and that’s it and also to put lifts or ramps to the platforms from the streets. Hardly worth it, though, is it? Hang on! The Piccadilly used to terminate at Rayners Lane so why not terminate there! More people use the Met at Uxbridge hence there’s more trains. Stations from Ealing Common to Rayners Lane are not fully step free and we’re worrying about where the Picc goes…really? If Picc goes to Ealing B. (but doesn’t go to Uxbridge) at 4tph roughly keep the District line going to Ealing (reduced service) but make a shuttle between Ealing and Rayners Lane/Uxbridge using the District Line so you can make North Ealing Upwards step free. How would passengers actually be able to leave the platforms (except Sudbury Town EB) after alighting from these step-free District Line trains? Sudbury Town has level access off both platforms and the footbridge has ramps (a rarity at a Charles Holden station) enabling disabled users to pass across the tracks to either side. Yes the other stations have accessibility issues. However in my view one of these, South Harrow (southbound/eastbound) could be adapted quickly as a interim measure if TfL were to build a ramp by the old station buildings. I expect someone may point out why this would not be feasible. Former Uxbridge Met passengers would get a similar journey time as far as Finchley road and two extra stops to Baker Street, then direct service to West End, Waterloo, London Bridge and Docklands. Met customers from Harrow on the Hill north would get a faster journey as Preston Road and Northwick Park would be transferred to Jubilee with platform heights adjusted accordingly. Yeah but now you’ve got height issues at Northwick Park and Preston Road as it was originally designed for the Met. This discussion is about Piccadilly going to Ealing as opposed to Jubilee to Uxbridge! There’s a 2050 tube map and doesn’t mention anything about Piccadilly going to Ealing. Are we saying that if Piccadilly does go to Ealing that more district can go to Richmond as more people use that branch and no district to Ealing? If so that means laying more Piccadilly Line trains going to Ealing and having more congestion at Acton Town. It’s not worth it!! Especially when New Tube for London is arriving and going to make Acton Town even more crowded as it is!! Just change the height of the platforms at Ealing Common at one end so it is step free and make stations North of North Ealing* step free (somehow). South Harrow add lifts and extended ticket barrier. Also at Park Royal, Alperton and Sudbury Hill just add lifts near to the stairs so disabled people can travel. @MAX – true about Northwick Park and Preston Road, but a relatively easy task to raise the track a little to suit tube stock. Same issue at West Harrow, and the appropriate platforms at Harrow on the Hill and Wembley Park. Other ‘compromise height’ platforms to Uxbridge inclusive would also be affected. Still as you say the article’s supposed to be about Ealing so I’ll shut up about the Jubilee. Ditto @Greg’s comment, for the Uxbridge branch. The Piccadilly line is tedious to use into central London, taking 20 mins longer to get to Kings Cross than the Met – that a sizeable proportion of extra journey time. If the plan to run the District only to Richmond occurs, I would hope very much it is only the Pic Ealings that make any extra stop at Chiswick Park. Crayoning in this case is long and pointless exercise, as, ultimately, you just wouldn’t wish start from where you are. But that’s the rub – its the limitations of what exists at the moment combined with what a realistic business case can be constructed for that dictate the extent of what one may do. I personally think the elimination of platforms of compromise height sets a bad precedent for the future arrangement of services in West London. Mind the gap between (eastbound) train and platform! Though in the extra 20 minutes to Kings Cross the Piccadilly has called at 10 other zone 1 stops and is on its last one having crossed through the heart of the West End, whereas the Met line has called at only 3 other zone 1 stops, all peripheral. A better example is Green Park – an earlier interception point between the two routes, which still strongly favours the Met as the quicker route, even with the change at Finchley Road. If the Jubilee does go to Uxbridge then you will have spare Metropolitan trains and where would they go? You would need to build more 1996 stock to do the Jubilee and add more congestion onto the already congested line. We are definitely keeping the Heathrow branch even though Crossrail is going there we are still keeping it because above it says that “as Crossrail is going to Heathrow then there is going to be less Picc trains going there” which is wrong cuz the whole point of Crossrail was to add capacity not to replace it. If the Piccadilly is the only line west of Turnham Green then what line uses Ealing Common Depot? If it is Picc then you will need to find some space somewhere on the District to put the S stock. You can’t run empty coaching stock from Ealing Common Depot to Turnham Green or Richmond as it takes too long – TfL would be losing money due to the fact that the District is running between Acton and Richmond where it doesn’t earn any income. They have gone through a lot of pain trying to extend the Depot at Ealing it would be a shame to waste the money. I was on the District at E.B. during off-peak and I couldn’t even sit down as all the seats were taken; trying to put smaller trains there isn’t going to work. Extending the platforms between North Ealing and Rayners Lane for the district is going to cost a lot. Even though more people use the District at Richmond compared to Ealing, TfL are still keeping the same frequency for both branches at 8tph for the 4LM project. TfL have no plans to covert it to the Piccadilly as the 2050 tube map doesn’t show it. If you are going to make the Picc go to Ealing does that mean taking off a few trains on the Uxbridge branch to cover the Ealing Branch if so that’s not a good idea because the Uxbridge branch is already at 6tph and it gets very crowded. Also we are not putting Piccadilly trains to Stamford Brook and Ravenscourt Park unless as the Picc is going to Ealing that there is more congestion on the fast lines so maybe for the Picc going to thenEaling branch only, to stop at the intermediate stations. Ealing Common depot stays with the District. The distance ‘off-route’ is relatively short. It only affects the train when it comes out in the morning and goes back in the evening. So many drivers will still complete a full productive shift. Even if a train is taken out of service between the peaks it doesn’t follow that it has to go back to Ealing Common. I am not saying it will happen but it must be perfectly possible technically to send the trains to the depot after their last stop in service once full ATO is introduced. Similarly in reverse in the morning. If that were to happen (unlikely I would admit) it would kill your argument stone dead. TfL have no plans to covert it to the Piccadilly as the 2050 tube map doesn’t show it. Nonsense. TfL are not so stupid as to include something they haven’t officially announced as policy. That is just asking for trouble. Equally you might as well argue there is no intention to separate the two parts of the Northern line even though it is an open secret that London Underground would like to do it – but haven’t committed to it. How does a train from Ealing Common Depot go to Richmond? or to rephrase the question, how does it turn around at Turnham Green? The Northern branches of the Northern Line (pun!) to be separated, ermm it is not exactly official and that’s why its not on the map. Running empty coaching stock between Ealing Common Depot and Turnham Green/Richmond is a bad idea because you are having to pay for the electricity and not earning money between that section so you are losing money. ‘Relatively short’ really? To get from the Depot to Richmond and I’m guessing you would have to turn around at Barons Court (imagine the hassle) to then come all the way back again. When Ealing Common Depot is so close to Ealing Broadway it makes it super easy to get away or to enter the system. Let me rephrase the question – or rather put a slightly different question to you. In respect of the Richmond branch in what way is this different to what happens today? Effectively the only change of any significance to your argument is that trains will run out of service between Ealing Common and Turnham Green. That affects just three stations. Relocated platforms at Chiswick Park would be served by Richmond trains and both Ealing Common and Acton Town will still be served by the Piccadilly line. This would only apply to trains to and from the depot. This would be no great loss. Just because some trains are not in service doesn’t necessary mean much if there was limited use anyway. In any case, if your argument had any validity at all you have to do is run the trains in service! There is a precedent of sorts for this with there being early morning and late night strange multi-line services in passenger use – such as Circle line trains starting from or finishing at Barking depot. On the issue of the Tube 2050 may, this was not announced policy when the map was published (although various publications surreptitiously suggested this was the intention). The proposal might well not happen just as the Metropolitan Line Extension didn’t but this would almost certainly be due to lack of money rather than lack of intention. The stock will use less electricity when running empty and not stopping than in service and stopping. Just have a very good look at what all the TOCs on the NR network do with ECS movements into and out of stabling / depots. I would guess that the very first morning Richmond departures are stabled at the station itself, and as the branch service builds up it is largely supplied by stock overnighting at Lillie Bridge sidings. If there is a particular need to get an empty unit from Ealing depot to Richmond it can simply go into Lillie Bridge to reverse. Yes. Train 117 stables overnight at Richmond. This can be verified by looking at page 7 of the District line Working Timetable. On page 11 it can be seen that it arrives at 0007 and departs at 0722. I do find the original assertion a bit of a nonsense. The Victoria line has the depot about a mile off the route. It takes four minutes just to get from Seven Sisters to the depot reception road and four and a half minutes in the other direction. Moreover, the depot is the only one on the line and so affects 38 trains that enter and leave service each day from the depot (others are stabled at Walthamstow Central, Victoria and Brixton). As far as I can tell from the working timetable, Ealing Common only had 19 District line services entering service – hardly a big deal. You do know that S stock has regenerative braking so when it brakes it saves power so by running services makes a profit than running empty and also if district is running on the relief lines between acton town and Turnham green would that be congested with the Picc stopping at Chiswick park? Even with regenerative braking you can’t make a profit by running empty trains! Regenerative braking can only convert some of the train’s kinetic energy back into electricity, and never as much energy as was used to accelerate the train the first place. (And of course an empty train has less kinetic energy than a full one). What would be the point of that, may I ask? You then have a S Harrow – Rayners Lane gap, don’t you? Go and visit Rayners Lane, and see how many people change between Met and Piccadilly there. Both same-platform (ie EastcoteS Harrow, and ‘over-the-top’ (ie W HarrowS Harrow). Piccadilly to Rayners (if not beyond) is a key link in the network. It’s not just people changing there, but people travelling through on the Piccadilly Line from Ruislip/Eastcote/Uxbridge to Acton, Hammersmith, Earls Court etc.